Welcome to my blog! I am very excited and honored to spend this time and insight with you. I am hoping to cover a different card of the Tarot every week. The insight given will be from my own meditations with the cards and I will also incorporate some of the more traditional meanings of the cards. Hope you enjoy these messages and any feedback is appreciated! The first card in the Major Arcana is The Fool. When I meditate on this card what comes to mind is jumping into the unknown and jumping with trust in your heart. This card also involves taking risks and trusting in the process that change is inevitable. The Fool’s bag could symbolize that he she/has everything she/he needs within himself/herself for this new journey ahead. The Fool also is connected with spirit and with the light of consciousness seen by the sun above. This card reminds us that we need to keep our energy moving so we don’t become stagnant in our lives. Sometimes we need to make that jump and take the risks that we are most afraid to take. This needs to happen for use to continue on our paths of spiritual development and awareness. The Fool also reminds us to connect with our sense of humor and be silly and have fun. The Fool is numbered 0, the number of unlimited potential. The Fool can come either at the beginning of the Major Arcana or at the end. 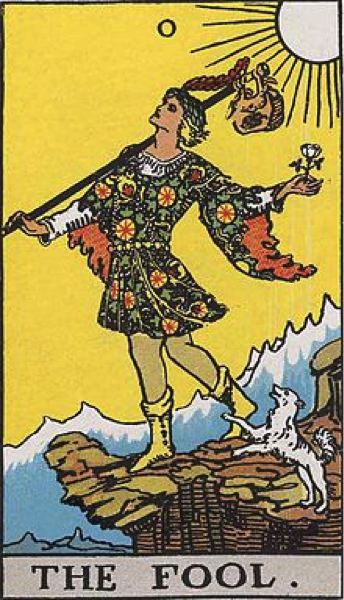 The Fool is shown at the beginning of his journey having unlimited potential and the e sun rising up behind him represents the beginning of a new journey. He is looking upwards, toward the sky, or Spirit. He has all the tools and resources he needs in the bag on his staff but he has not opened the bag yet. The white dog will protect him throughout his journey but will push him to learn the lessons the Fool came here to learn. The mountains behind represent the realms of Spirit that he has just left and will spend his life trying to reconnect with. The Fool helps us in reaching a state of renewal and new beginnings, where each day is an adventure and each moment is lived to the fullest. The Fool card represents the beginning of all creativity and a desire to accomplish new goals. The Fool indicates that anything can happen and the opportunities are just waiting to be taken advantage of. The Fool is all about new experiences, personal growth, development and adventure. The Fool Tarot card asks you to take a ‘leap of faith’ and to trust in the Universe in that if you begin a new journey, you will find success. This Fool lives a carefree life, free from worry and anxiety. If you are facing a decision or moment of doubt, the Fool encourages you to believe in yourself and follow your heart no matter how crazy or foolish your impulses may seem. This is a time when you need to truly ‘believe’ and have faith in where the Universe is taking you. The Fool is an excellent Tarot card to meditate on if you are experiencing a lot of fear in your life. The Fool enhances courage, risk-taking and the creative expression needed to open up new areas in your life.